« Grease-The Megillah Adult Purim Party! 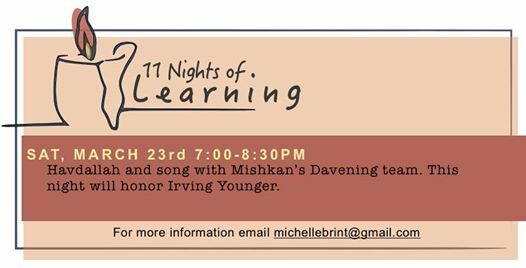 For our eleventh meeting, Mishkan Chicago’s Davening team will be closing our learning series with Havdallah and song. We will be honoring the life of Irving Younger as we hold all of the victim’s memories who we have honored prior. You do not need to be a part of the congregation, community, or space we are gathering in in order to attend. All identities always welcome (although please note that all of our learning will be co-ed). If you have any questions or concerns in terms of access and inclusivity, please email michellebrint@gmail.com. More on 11 Nights of Learning: After the Tree of Life shooting this past October, we (two Jewish educators living in Chicago) wanted to do something to honor the dead. The result is 11 Nights of Learning, a series of gatherings, one for each life lost, where Jewish people from all over the Chicago area can learn, be together, and remember. One, to create inclusive, connected spaces for the wider Chicago Jewish community, by holding these nights across the city, across Jewish practice, and across styles of teaching, learning, and remembering.